Even for speakers who are more than happy to stand in front of large audiences, the humble camera can pose a real challenge. 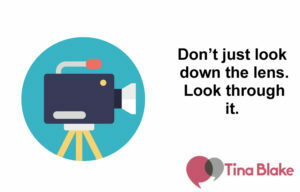 Novice speakers aren’t alone in feeling nervous around a lens, – there’s something a bit unusual about it’s unblinking eye that can unnerve the best of us. Partly this is just the fear of the new. Cameras are ever-present in our lives these days, of course, but speaking for any length of time in front of one is still a novel experience for many. When in front of a live audience there’s an atmosphere. Speakers receive feedback of all kinds – sometimes subconsciously – from being able to see other people’s faces. Likewise, the audience feel a connection to the speaker, since they are, after all, in the same room. Becoming more comfortable with the camera is critical to helping your audience feel relaxed when they watch your video content, … but the absence of other humans is very often exactly why speakers don’t feel comfortable. The trick to cracking the camera lies in trying to replicate that connection between speaker and audience, if you feel it, you’ll relax; if they feel it, they’ll listen. Step one, then, is simple: try to forget you’re talking to a camera. Don’t just look down the lens … look through it. Imagine the person on the other side of that lens, who’s watching your video. Speak to them, and not to the lens in front of you, that way you will make the camera your friend and transform how you appear on screen.